Getting a prescription filled shouldn't take hours. Joseph F. Ernst was a man with a soft heart that devoted his life to helping others. It is only fitting that in 1964 he opened the doors to his pharmacy. After servicing the community for many years, Joseph closed his dream store and retired. Those doors remained closed until one of his sons, Bill Ernst, decided to reopen the store in 1992. For the past 25 years, Ernst Pharmacy's employees continue to carry out the mission of servicing the Miss-Lou community. 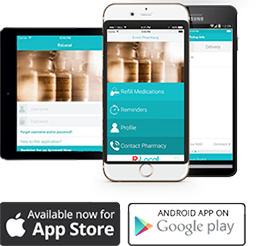 Refill from your mobile device by installing our mobile app. Or by visiting our website.